It's that time of year again (well it was a few weeks ago) and American Football (or just football to those of you in the States) is back! 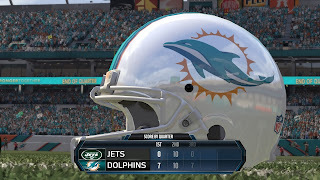 Unfortunately it seems that my team's season is already over so I will just have to live the dreams of every Dolphin fan through the latest incarnation of Madden, par for the course really. Your first introduction to the game is an Arizona/Pittsburgh Superbowl 50, definitely not what I was looking for... 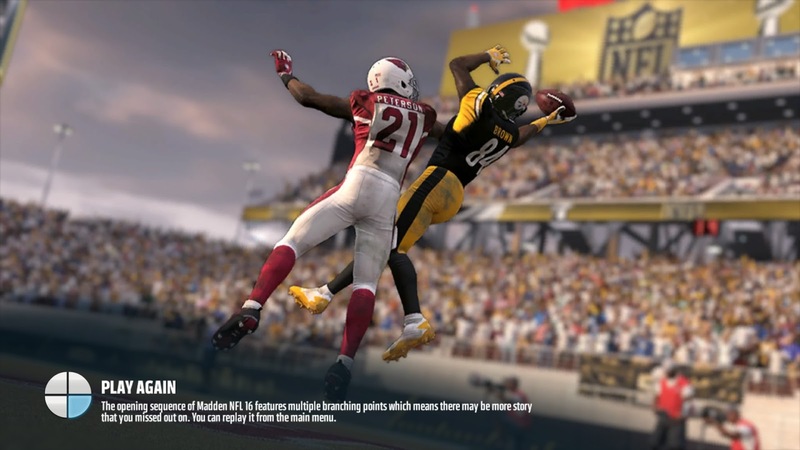 But the graphics were impressive and the multiple storylines that can unfold in the opening sequence does sound intriguing, I just won't explore them as I am not interested in playing as Big Ben and The Steelers. EA probably would have had more success here if they allowed you to pick your team prior to this and then fit the storylines around them. 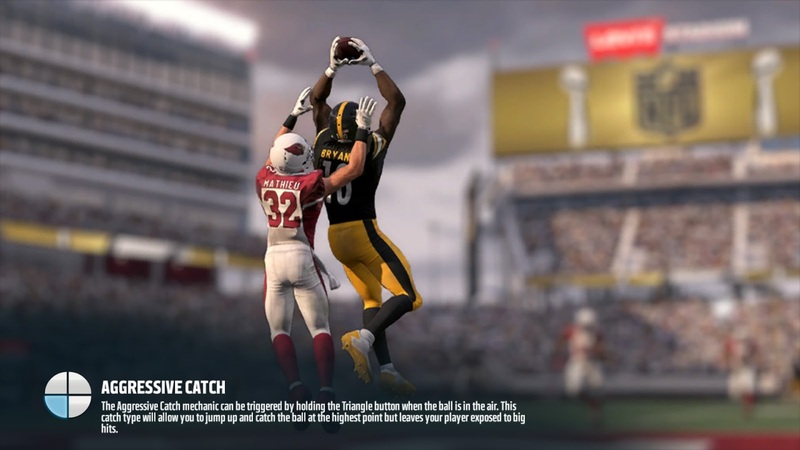 It seems that Wide Receivers are the focus of Madden 16 with three new types of catch available to players; Possession, Run After The Catch and Aggressive. The game also seems to favour Wide Receivers over Cornerbacks in play as well, which is perhaps indicative of the NFL today. Through a few games my favoured type of catch is the Aggressive catch, and in the Red Zone it felt that once this catch type was selected the "defense" never stood a chance. 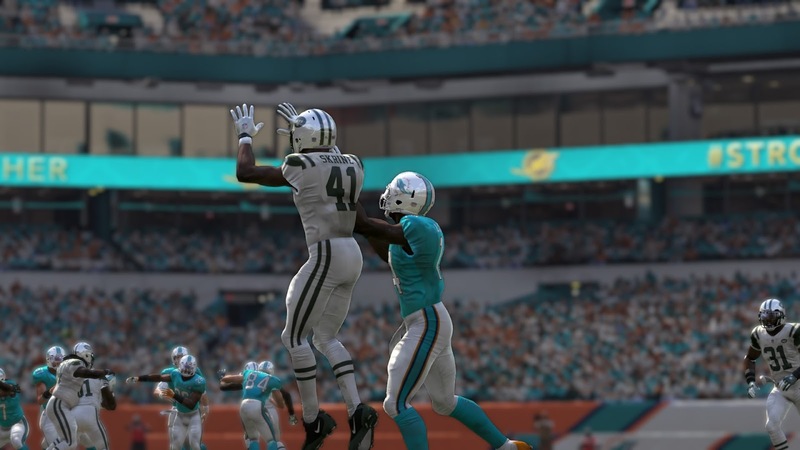 For example, this catch saw Jarvis Landry beating Skrine to the ball using the Aggressive catch button. While I accept that there is an opportunity for Landry to grab the ball, honestly Skrine should at least be able to jar the ball loose. 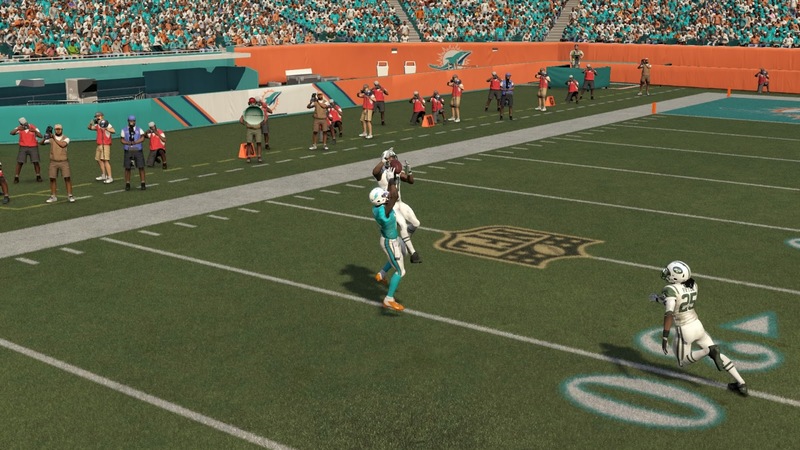 This is just one of a number of examples through my first few games that saw a receiver beating their man to the ball in a less than favourable situation. 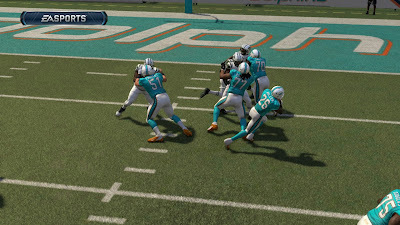 Stepping away from the flashy passing "offense" for a moment, the ground and pound attack is still effective. 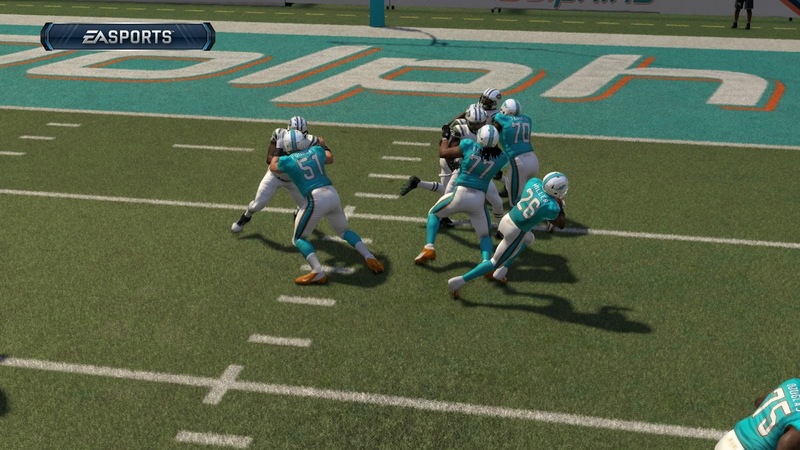 Playing as Miami I didn't have access to your stereotypical power backs, à la Adrian Peterson, but Lamar Miller had no issues running through the trenches. Unfortunately, he felt a bit like a pinball bouncing through the tackles and the controls just feel a little loose. Once you are out in the open your nimble RB starts to feel unresponsive with the reactions of a sloth, or overcompensating on the cutback which turns into more of a juke and stops all his momentum dead. However, when it comes to presentation you just can't beat Madden. The little additions in this area makes it feel like a complete TV production that Fox Sports and co would be proud of. 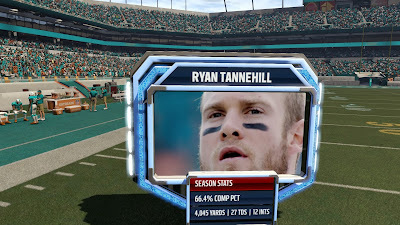 CGI interspersed with TV footage really brings it all to life and it has come a long way from Madden 13 with its limited "TV style" pre-game show. Clearly the guys and girls down at EA haven't seen Sun Life Stadium recently as there are no fans disguised as empty seats... Maybe after the Dolphins and Jets visit London. But at least it keeps the fantasy alive for those fans whose teams will let them down as the season continues. 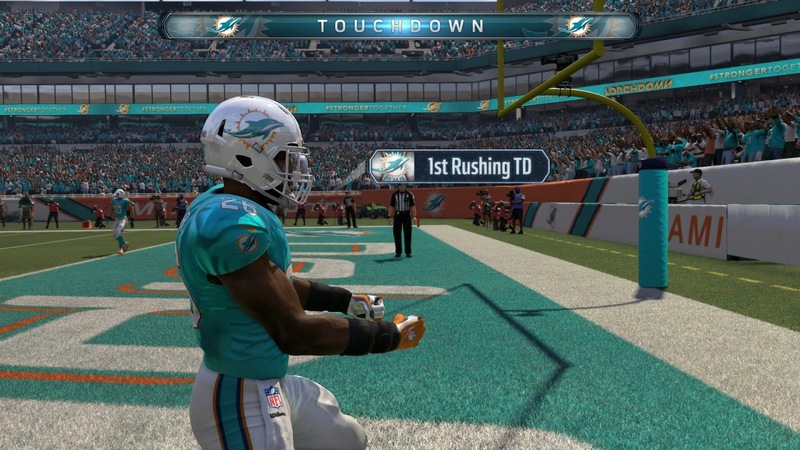 Maybe next year my 'Phins will have their year, but until then there is always Madden. 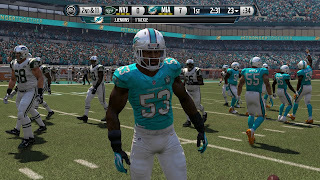 Thank you EA for providing me moments likes this, who knows when I will see the actual Dolphins manage it! Welcome back to JonDoesGaming, it has been a quiet few weeks on here due to some real life matters but we are now back with a bang! Today we are taking a look at an introductory battle in the WW2 tabletop strategy game Bolt Action, to make things easier we limited the armies to only 500 points and neither side brought tanks. So before we get down to the actual battle lets take a look at the two armies involved. Looking at the two lists involved the British forces had two main advantages. Firstly, they were a mid/late war list and this allowed them to take SMGs on their NCOs, without this everyone in the squads would have been armed with rifles. With hindsight this may have worked in the British army's favour with the "Rapid Fire" national rule but we managed to forget about this for much of the battle and it didn't come into play. The second advantage for the British was the Recce Carrier. The Carrier was impervious to all of the available German weaponry and with two LMGs could suppress most units as effectively, if not more effectively than the MMG. The scenario in play was "Top Secret" and we were using the Downed RAF Pilot as our objective. 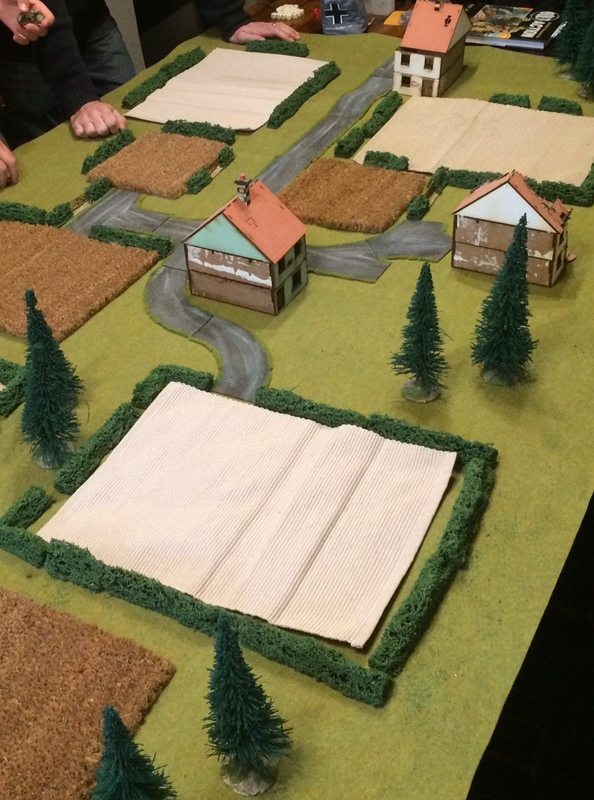 The setting for our battle was a small French farming hamlet with some ploughed, and some corn, fields. The downed pilot was in the middle of the hamlet, hidden from view here, next to the blue-topped house. The British forces would enter the battle from the right hand side using the buildings as cover while the Germans would have to approach from the more open fields. We made a small error here as we forgot to deploy the Forward Artillery Observer team before the battle began, instead they would enter the battle alongside the rest of the British forces. The spotter for the British mortar set up in the house at the far end of the hamlet giving him a good view of all proceedings. The German sniper team set up in the small wheat field towards the German side. The first dice out of the bag was British, and the Recce Carrier trundled on before opening up both LMGs on the sniper team in the field. The sniper was pinned and his spotter died but he remained steadfast. Unfortunately, for both sides, about half of each army decided they did not want to get involved in the battle early on and proceeded to remain off the table, including the British HQs! The Forward Artillery Observer made it to the ruined house and set up by a window, ready to call in some support at a moments notice. Two squads of British infantry made it to the battle, one taking up position alongside the Recce Carrier and the other flanking the ruined house. The German sniper did manage to put one pin marker on the squad on this side of the ruined house, a German infantry squad and their HQ arrived but apart from that the turn remained pretty uneventful. Now things started to heat up. The first dice out of the bag was German and the infantry squad in the cornfield decided to advance and open up on the British infantry squad that arrived last turn, keeping them away from the pilot in the centre of town. Unfortunately for them they were just out of range which meant that when a British dice came out next they were able to move up in full knowledge that they would be in range, pinning the German squad. Towards the centre of the battle, the second British squad moved up to the bocage alongside the small cornfield in the middle of town. The Recce Carrier pushed forwards and forced the German sniper to hit the deck. The British mortar team arrived from reserve and set up behind the ruined house, relying on their spotter to pick out their targets. The British HQ decided that things had turned in his favour and took shelter in the ruined house waiting for his chance to claim the glorious victory. The German reinforcements decided that this fight was still not for them and stayed hidden, the final action of the turn was for the FAO to call in his artillery bombardment right by the HQ and sniper. The artillery arrived with a thunderous cacophony, putting two pin markers on each of the sniper and German HQ, but with very little else on the German side the effects were negligible. After the bombardment the German reinforcements decided it was time for them to show up and put a bit of pressure on the British forces. The German MMG set up in one of the ploughed fields near the British spotter trying to get a good field of fire across the centre of town. The British countered this by sending the Recce Carrier through the cornfield and unloading both LMGs into the MMG, pinning it and killing 2 of the 3 crew. The British mortar opened up on the German infantry but failed to find its range. One British squad moved forward to grab the objective but the second infantry squad, which had been targeted by the German sniper previously, failed its order check and hit the dirt. This left the first squad out in the open without much support and they proceed to pick up pin markers from every direction. The British MMG arrived and set up in a position to provide cover fire for the British forces to pull back with the objective, however, the final British squad remained out of the fight. On the German side the final squad arrived and pushed up as far as they could. With the squad holding the objective under heavy fire the British forces jumped into action to provide support and get their pilot out of there. 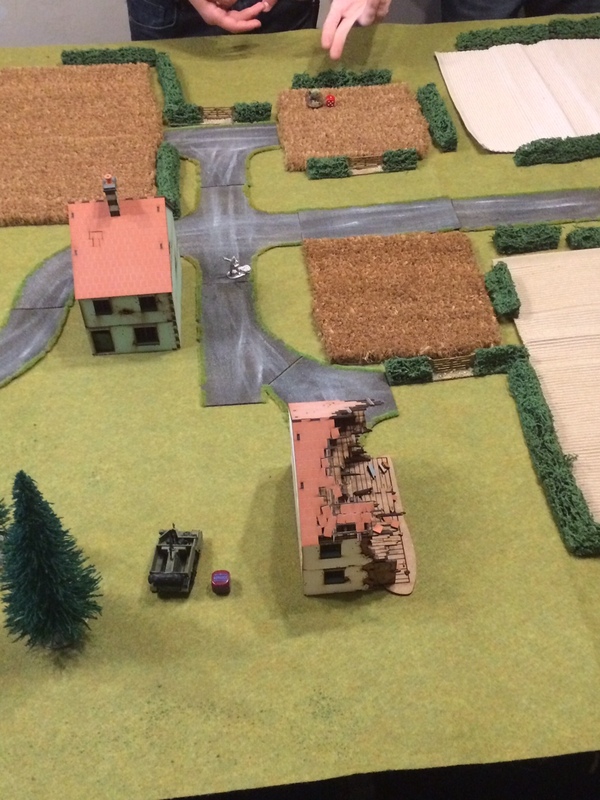 The mortar tried, and failed, to find its target again, the Recce Carrier moved forwards to block the line of sight to the squad holding the objective and unloaded both LMGs into the German HQ unit, but failed to hit the target. The first infantry squad, who had taken most of the German fire up to now, managed to pass their order check (with 4 pin markers!) and caused four casualties to the nearest German squad. The HQ and second infantry squad moved into a position behind the first squad and proceeded to move the objective back away from the German front lines. The British FAO team came under fire from the sniper and they were blown away, but this did open up a lane of fire for the British MMG to wipe out their German counterpart. The final British infantry squad arrived and the pilot passed to them. At this point we called the battle as there was no way for the Germans to stop the pilot escaping with the British. After the first turn was out of the way the action was fast and furious. With German numbers so low the fact that half of their force didn't arrive until the latter half of the battle really hamstrung their plans. While the German veterans were more resilient than the British regulars, the greater numbers of the British forces allowed them to overwhelm their opponent. The Recce Carrier, proved to be points well spent, if a little overpowered for this battle, as it provided a reliable rate of fire to keep some of the nastier German units held down. Knocking out half of the sniper squad, and two thirds of the MMG team really helped to keep the pressure on the Germans. Another candidate for the MVP title was the first British infantry squad, they grabbed the objective, held their ground and passed an order check at -4 while also taking down 4 German infantrymen. I was left underwhelmed by the Medium Mortar, needing a 6 to hit each time the enemy moves mean it is 50 points that can probably be spent better elsewhere. I have no doubt that when it hits it really hits hard but the lack of hits really limits its effectiveness. On the German side, the sniper has to be the MVP. It was handing out pin markers like candy and certainly posed a threat that I was unsure of how to deal with. I would certainly consider including one of these instead of the mortar in my next British army. The scenario was fun, although being able to pass the objective down a "conga line" did seem a tad unrealistic at the end. I don't feel this would have made much difference as the British forces had swarmed the centre of the town at the end and I could not see any way for the Germans to secure the objective for themselves. All in all, Bolt Action is a great game, with simple rules that make it easy to learn but challenging to master. I look forward to adding armour to our battles and also the possibility of using the experimental rules for aircraft when the time comes.